In case you missed the news, here’s the quick recap … and the lessons we can learn. Last week Pepsi debuted a new ad featuring Kendall Jenner handing out Pepsi in some kind of effort to save the world and right all of our current wrongs. It got blasted for its flippant insensitivity to real-world problems (and rightly so). Pepsi spent a fortune on this ad – so to have made the mistake in making it in the first place already raises a lot of questions. It wasn’t like it was done by some rogue agency. People at Pepsi saw this first. But that tone-deaf stupidity aside, there’s another lesson to learn here, namely the reminder that nothing dies on the Internet. Sure, Pepsi has apologized for the ad, and gone ahead and pulled it from their own promotions, but it’s still out there for anyone to see. They have no control of their message – and none of us do. Many companies out there think that a simple apology and deleting a tweet can make everything right again, but it doesn’t. Things don’t go away online. That video above? It’s not officially posted by Pepsi – it’s uploaded by some Kendall Jenner fan on YouTube. Yes, it might get pulled at some point (maybe even by the time you read this) but this unofficial post of the ad has been viewed 8.4 million times now. Pulling it themselves didn’t make it go away. 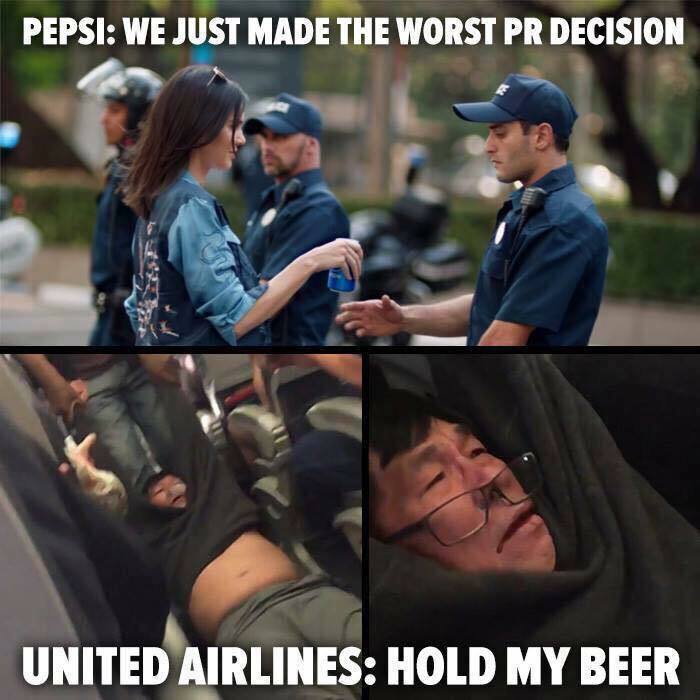 Luckily for Pepsi, United Airlines quickly took attention away from their big mistake with a huge disaster of their own. And no, they didn’t just break another guitar. Due to the now pretty much standard airline policy of overbooking flights, United Flight 3411 from Chicago to Louisville was overbooked and needed a “volunteer” to give up his seat. Well, they didn’t get a volunteer and they had to boot someone from the plane since there simply weren’t enough seats for all the tickets they’d sold. No one volunteered, so one unlucky guy was told to leave. He refused, and United called the police. Well, not only did the passenger still refuse to leave the plane when law enforcement arrived, but he was forcibly removed from the plane, getting violently bloodied along the way. And, since cameras are everywhere, the event was recorded, shared online and became a whole new PR nightmare for United. The CEO apologized for the incident… but the damage was done (and the apology came after first sending an internal memo to staff defending the response, and referring to the passenger as “disruptive and belligerent”). This whole thing made the Pepsi ad debacle seem minuscule in comparison, since it was a real person, in a real event, with real blood … who really didn’t do anything wrong. After all, he paid for his ticket – there was no good reason he should have been kicked off the plane in the first place – and it never should have gotten to the point of violence. Since this guy was pretty much like anyone else in the world who’s ever traveled, empathy kicked in pretty hard with the “this could have been me” aspect doubling down on the impact. Lesson #2: Your Actions Are Always Public. Cameras are everywhere. Every one of us is carrying one, and every one of those is connected to the Internet with a variety of ways to broadcast whatever it is they capture. And if it’s something shocking? Well then everyone’s going to see it. So why in any instance would you want to act like United did? There was no version of events where this would look good for them. 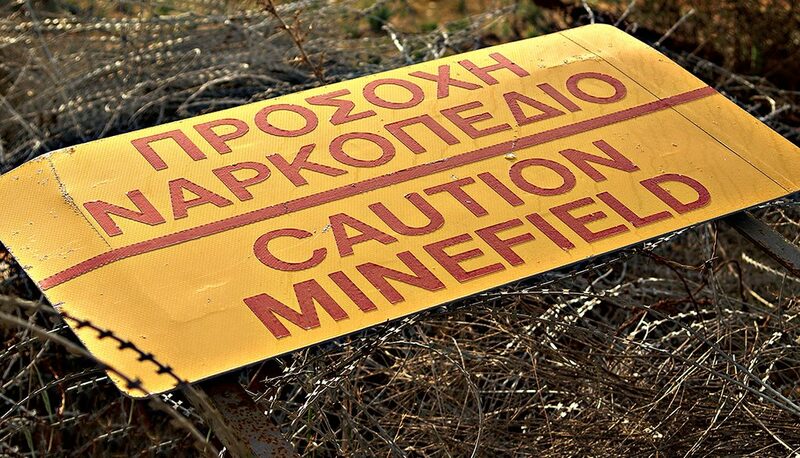 But things happened and got completely out of control … and everyone found out about it. People used to be able to hide their indiscretions, leaving the worst that could happen to accounts of hearsay. But that’s not the case now. Everything you do can be recorded and broadcast and it’s all a representation of who you are. United just showed us a good example of who they are. And now everyone in the world knows. Never one to stay out of the spotlight, White House Press Secretary Sean Spicer quickly grabbed the attention again for himself by, when talking about recent chemical attacks in Syria, saying “You know, you had someone as despicable as Hitler who didn’t even sink to using chemical weapons,” completely ignoring the fact that millions of Jews were gassed and murdered in the Holocaust. Given the fact that the Trump Administration has already been painted by some as anti-Semitic, the comments by Spicer quickly led to outrage in the press and across social media as not only wrong, but insensitive and dangerous. This honestly could be a lesson from any of the events covered here, but Spicer makes the best case for it. Since the job of the Press Secretary is to be the voice of the President to the Press, anything he says is automatically a representation the President himself. The way Pepsi’s advertising team completely disregarded the cultural significance of Black Lives Matter and Women’s Rights marches? Pepsi hired that team, so that’s a reflection of Pepsi. The way United resorted to force and violence to solve a problem? United hired the team that called in the police, so that’s a reflection of United. The way Spicer flippantly disregards the facts of history? Trump hired him. That’s a reflection of Trump. When we appoint others to speak on our behalf, we are giving them to power to guide our brand. We make the choice of who to put in those positions and the people who speak for you are by all accounts, extensions of you or your brand.